Center Point Crossbow Reviews – Is Sniper 370 Any Worth? >> Center Point Crossbow Reviews – Is Sniper 370 Any Worth? 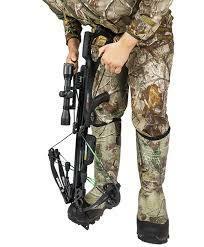 Choosing the right crossbow can be tricky with such a plethora of options out there. It makes no difference if you want a crossbow for your weekend hunting sessions or you just want to train for competitions. The truth is you do have options and some of them actually stand up in the crowd. While looking for a reliable product, you'll inevitably run into a lot of Center Point crossbow reviews. If you want quality, money and a decent price, CenterPoint Sniper 370 Crossbow is probably one of your top choices. When it comes to getting as much as possible for your money, CenterPoint's Sniper 370 model will definitely lead the pack. It's probably the best crossbow for the money if you put together its features, small bells and whistles, price and accessories. Featuring a five year warranty and a warranty card for the original owner, it's obvious the manufacturer is quite confident in its product. The Sniper 370 crossbow is suitable for anyone, regardless of how skilled they are. It makes no difference if this is your first crossbow or you've already had some before. According to most Center Point crossbow reviews, the Sniper 370 model brings in everything you need for a comfortable experience out of the box. The package contains the actual bow, a scope, a four arrow quiver, three 20 inch carbon bolts, a shoulder sling and a cocking rope. You also have the warranty card with your name, not to mention a small owner's manual. Unlike other bows in this segment, it comes with a cocking rope to make cocking a breeze – a feature that every crossbow should have. Sometimes, you'll have to buy it separately though. Out of the box, the crossbow must be put together. It's an easy job – just follow the instructions in the manual. There are just a few parts that must be fitted. All in all, you can start using the crossbow within 10 minutes only. Speed is one of the first things you look at in a crossbow. The faster it goes, the more accuracy you get. Plus, your target won't have enough time to move, even if it actually hears you firing. This model goes up to 370 feet per second. It's about 10% faster than other crossbows in this segment. If you use it for hunting, your prey has no chance to escape a well shot arrow. Cocking has always been an issue, especially for beginners. With this crossbow, you won't have to worry about it. The drawing weight might seem a bit overwhelming at first – 185 pounds. Again, it's more than what you'll get from an average crossbow in this range. But then, you have a solid cocking rope device that will make this operation piece of cake. There are more considerations that make the Sniper 370 model the best crossbow in this price range. The full adjustability is one of them. It's an excellent feature for beginners who haven't defined their style yet, but also for experienced users who adjust their style based on the activity they perform. All in all, this crossbow can be used as a tactical stock weapon, but also as a forearm weapon. Its rifle style makes it convenient and easy to use. You can easily rest it against your shoulder. It gives you more stability while you aim. Moreover, if you find it heavy, the extra support will make it feel lighter, especially during long hunting sessions. 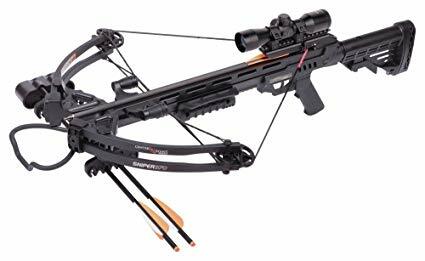 Known as the best crossbow 2017, this model measures 25 x 13 x 12 inches. It's a general compact size, meaning the crossbow is easy to carry around and allows firing without causing any discomfort. Despite its aerated design and ease of use, it won't overwhelm you with its size. In terms of weight, it goes up to 7.9 pounds with no accessories on. It weighs more than the average crossbow in this range – even up to 30% more than other crossbows. However, quality is never lightweight. The ratio for sizing and weight is quite unusual. But then, it features a shoulder sling for easy carrying. Also, it's not so heavy to put pressure on your arms when you aim or carry it. The rifle style helps by passing some of the weight against your shoulder. While rated among the cheap crossbows, Sniper 370 won't disappoint you in terms of quality of materials and construction. Although its systems might feel heavier than in other crossbows, it features some lightweight parts that will make the difference. The rail is made from aluminum. Its CNC machined for superior precision. Not only is it durable, but it's also lightweight. The same rule applies to the shoot through riser. The quad limps are not to be overlooked either. Just like the rail, the cam system is CNC machined. 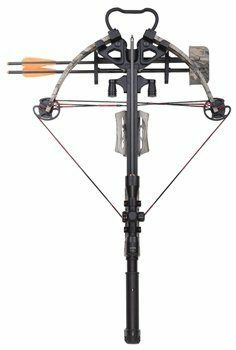 While the crossbow might look aerated and basic, it's based on technology and professional engineering for a top-notch experience, hence the wide variety of reviews from this particular brand. The limbs are made from compressed fiberglass, while the stock is composite. Aiming will never be an issue. While professional archers don't always need a scope for short distance shots, it's highly indicated to use one as a beginner. It will help you get used to the crossbow and its accuracy a lot faster. Fortunately, this CenterPoint crossbow features a professional 4x32mm scope. It's made by the same manufacturer and it's known as the CenterPoint Sniper scope. 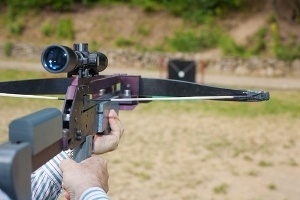 The crossbow features string suppressors. In other words, firing won't release too much pressure, not to mention the vibration. If you've fired other crossbows before, you'll be surprised to notice this one has no vibrations. From this point of view, firing is a quiet operation. Your pray is less likely to hear it – even if it does, the impressive speed will compensate. Safety is essential when it comes to crossbows and Center Point knows that. This crossbow features the classic anti dry fire system. It works with no problems at all. What does it do? Easy! It prevents accidental firing when there is no arrow fitted on. On another note, the automatic safety is not to be overlooked either. However, you will need to get used to cocking the crossbow, especially if you're a beginner. Simply put, you'll have to turn the safety off, use the cocking lever and then pull the string. 1. Can I change the bolts this crossbow comes with? Lots of buyers upgrade the bolts coming with their crossbows. However, it's important to read the manufacturer's specifications before making a decision. Generally speaking, the bolts coming as default are perfectly suitable for a crossbow. Moreover, same brand bolts are compatible, yet other parts can also be used based on the manufacturer's recommendations. 2. Are there any specifications for hunting deer? As a general rule of thumb, a drawing weight of 150 pounds of more should take a deer down. Bolt heads should be quite wide too – around 0.75 inches or higher. 3. What are the rules and regulations regarding crossbows? Laws and regulations vary from one country to another – even from one region or state to another. Therefore, double check the rules before using a crossbow, whether you use it with training purposes or to hunt. In the end, it's easy to tell why there are so many positive Center Point crossbow reviews out there. This manufacturer knows what it is doing and its products are superior. We rate this crossbow 4.7 out of 5 stars due to its speed, accuracy and quality build. Up to 91% of all buyers find it perfect or almost perfect.